Go on feed your addiction! Super dry scientifically formulated chalk packaged perfectly for any climb. 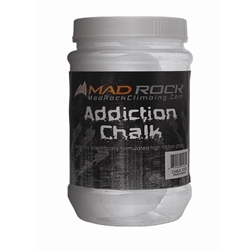 Mad Rock's Addiction Chalk - Sock greatly improves friction. The perfect solution for reducing chalk pollution. The combination of active moisture absorbency and fine grain texture makes it an essential part of your climbing arsenal. Feed your addiction! Each chalk sock is 2 oz.